What could be so monumental, so ultimately life changing that it just falls behind the aforementioned events in significance? Tonight, Tony will be trying out at an invitation-only session for a position as an official of the Division I WCHA (Western Collegiate Hockey Association). The WCHA is one of the premier DI conferences and continually produces Frozen Four and National Championship teams, with the participation of schools like the University of Minnesota, University of North Dakota, Denver University, Colorado College and University of Denver. 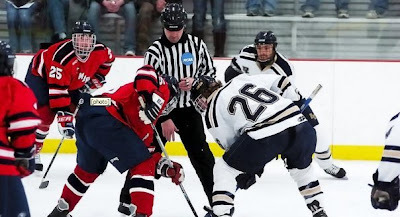 He currently has 3 years of MIAC (Division III) college level experience, has been selected for numerous regional training camps and was invited to a national high school tournament last summer . . . but this, this is the big time. Sure it's not comparable to the NHL, but that is not the route Tony wanted to pursue. 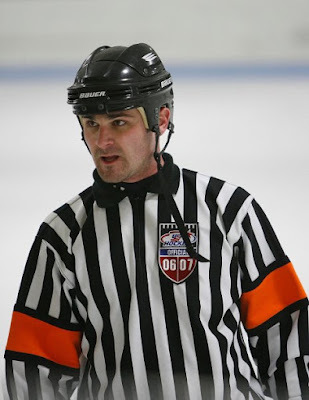 Ever since I've met him though, it has been his aspiration to officiate in the WCHA. I never thought I'd like a man in stripes. I'm so excited for him I could scream. I'm so ecstatic in fact that I haven't even allowed myself to be nervous about the previously mentioned concerns (ie that 50% were cancerous). Lord, you know the desires of my husband's heart and ultimately provide him the strength of his will and endurance. If it be your will that he enters the WCHA this year, I pray that you will bless him physically and mentally tonight. Allow him to flawlessly perform their physical demands and quickly deduce their officiating situations. Good luck to Tony!! That's big news for him! Good luck at the doc. I'll be praying for ya. And hello - good luck Tony! That's awesome news! How exciting!!! I am praying for you both! "After divulging my deats, the receptionist paused for a second before informing me that she'd just mark it as "personal." That was kind." LOL! Glad to hear the apt. was quick and everything turned out alright! I hope your husband did well last night!! GL to him!